There aren’t many people today who realize they’re using a mid-19th-century invention every time they send a fax. Yet the ubiquitous facsimile machine had its beginnings in the electric printing telegraph patented by the Scottish inventor Alexander Bain in 1843. What’s even more incredible is that commercial faxes were being sent between Paris and Lyon in France by 1865 — predating the invention of the telephone by more than a decade. Throughout the development of more modern communication methods — including the introduction of computers, email and wireless technology — the act of faxing as a secure, legal form of document transfer hasn’t become outdated in the modern office. Granted, not all business sectors rely equally on faxes to keep their day-to-day operations running smoothly. However, a recent survey by the International Data Corporation — or IDC — paints an interesting picture of the very promising future of faxing. According to the IDC’s survey, over the course of the past year, more than 80 percent of fax users found that the numbers of faxes they sent and/or received stayed the same or even increased compared to previous years. What’s so striking is that among the companies that experienced growth, the average increase amounted to over 25 percent. Moreover, nearly a quarter of respondents reported a growth in fax usage of more than 50 percent. With statistics like these, it’s no wonder that the role of the time-honored facsimile in the modern office appears to be as secure as ever — if not stronger. But while the act of faxing might be on the rise, what’s changing about the actual process and hardware used to transmit documents? With all the improvements made to office technology in recent years, what breakthroughs are occurring that bring the process of faxing once and for all into the 21st century? The answer lies in fax automation service from Softlinx. The security of point-to-point faxing is the primary reason many companies put up with the time, hassles and costs associated with maintaining traditional fax machines — along with all the paper and ink they require. Fortunately, thanks to the advent of cloud-based services, our world-class technology team at Softlinx has developed a highly secure and reliable automated fax messaging service that makes faxing as simple as attaching a document or sending an email. With our cloud fax application, your business can choose online faxing — even for the highest volumes of sensitive business documents — as a viable method of electronic document management. Our automated fax integration allows you to send faxes right from the application, via email or over the web. What’s more: You can receive inbound faxes directly in the inbox of your email account, your shared network folders or even your application systems. Put it all together, and it’s clear that this type of cloud-based fax automation can let you enjoy a whole new level of streamlined document workflow — saving you substantial time and costs in the process. Of course, the simplicity and convenience of purchasing a traditional fax machine and adding a fax line to the company’s telephone line is an option that many small businesses still choose. Since faxing occurs instantly and the price of fax machines is relatively low, businesses that go this legacy route can enjoy all the advantages of fax technology for a comparatively low initial investment. Companies that opt for fax automation can enjoy an even lower cost faxing solution — without losing out on secure document sharing with businesses of all sizes and levels of technology. At the same time, cloud fax automation allows companies that employ it to say goodbye to cumbersome fax machines and all the monitoring, maintenance and supplies involved with their use. The numbers associated with traditional faxing don’t lie. In the United States alone, it’s estimated that traditional fax machines consume more than 200 billion pages of fax paper annually. If just 10 percent of traditional faxes were instead sent via fax automation, approximately 20 billion pieces of paper — or roughly two million trees — could be saved each year. The savings don’t stop there either. When you consider the logging industry’s considerable consumption of energy and water in the production of paper, you’ll begin to see the bigger positive effects fax automation can have on the environment. Using the aforementioned 10 percent reduction in annual fax paper as a rule of thumb could result in a savings of about 720 million gallons of water — or double the daily water consumption of a major metropolitan area like the city of Philadelphia. In addition, the energy savings associated with that amount of paper reduction would amount to saving more than 400 million kilowatt hours — which equals about two months of New York City’s average power consumption. Another way of looking at it is that this amount of paper savings could help curb more than six million pounds of air pollution from entering our atmosphere annually. That’s the equivalent of removing the yearly pollution output of more than 5,500 cars. Clearly, cloud-based fax automation is a green solution with a huge potential to help our environment. And for many environmentally conscious businesses, this fact can be reason enough to make the switch to online faxing. But the savings and reasons for using fax automation don’t stop there. From a purely economic perspective, traditional fax machines are costly — in regard to both the supplies they consume and the time they require from your workforce to keep them maintained and operational. When you realize that the standard ink cartridge prints roughly 200 pages and retails for somewhere between $25 and $50, the move to automated faxing sounds better and better. Add to that the fact that the average worker spends about a minute per fax walking to and from the machine as well as operating it, and it’s easy to appreciate the cumulative savings fax automaton offers its users. Beyond environmental friendliness and cost savings, our secure cloud fax service supported by ReplixFax offers a wide range of faxing capabilities that many of today’s competitive businesses rely on for their high-speed, high-volume workflows to operate at optimum efficiency. Experts estimate that as many as 100 billion faxes are transmitted around the world each year. But when you combine that statistic with the rise in companies adopting Voice over Internet Protocol — or VoIP — technology to transmit voice and data via digital signals over the internet using almost any connected device, it’s easy to see the many benefits that fax automation offers. The shift from traditional landline telephony to VoIP systems is a major one that coincides with companies saying goodbye to their old fax machines in favor of an automated cloud-based service that can offer them much more — not least of all security. The majority of online fax services employ 256-bit encryption of the data they transmit, which is equal to the same amount of encryption used by security software, government agencies and other organizations in the security sector. Compliance, reliability and security: Our automated fax service is fully HIPAA and PCI DSS compliant. It’s supported by secure encryption methods during transmissions and while data is “at rest” in the cloud. Furthermore, our service features hosting by means of an ultra-reliable data center that’s fully audited by the American Institute of Certified Public Accountants — or AICPA — with SSAE-16 SOC reporting. Ease of application faxing: We offer cloud fax APIs with sample code and complete technical support during implementation to allow your company to more easily fax-enable all of your business applications. Disaster recovery in real-time: The services we offer through our primary data center are replicated in real-time via our remote disaster recovery setup, which supports your business’s continuity in the event of a disaster — and meets our recovery time and recovery point objectives. Simple-to-use end-user faxing tools: Our full set of faxing tools are user-friendly and include email to fax, web fax, print to fax and multi-function printer (MFP) support. In addition, you can take advantage of our web portal, which is designed to meet the needs of your business’s preferred methods of faxing. 100 percent focus on business faxing: With a complete focus on meeting the faxing needs of your business, we offer a variety of fax automation tools to streamline your document workflow processes, including electronic filing, folder faxing, barcode recognition and metadata passing. Superior customer service: Our U.S.-based support team is dedicated to providing you with round the clock first-class customer support, which allows us to bring you the very best in service and SLAs while also maintaining our promise to deliver 100 percent customer satisfaction. At Softlinx, we’ve helped organizations of all sizes — from small startups to Fortune 1000 companies — make the switch to fax automation. 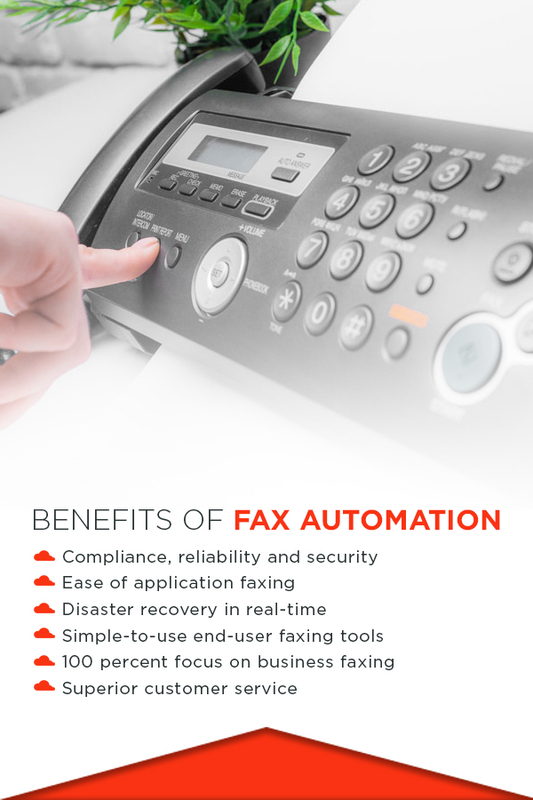 What follows are some of the most popular examples of fax automation by industry. Healthcare: HIPAA compliance and doctor-patient confidentiality issues are at an all-time high in the healthcare industry. That’s why the use of automated faxing — including data transfer via applications such as electronic health records, practice management and radiology information systems — helps create secure, productive workflows for healthcare organizations, clinics and professionals. Manufacturing: From purchase order processing to product management, online faxing helps manufacturers increase their agility, productivity and customer satisfaction — all while reducing operating costs previously associated with legacy fax equipment. Financial services: Companies in the financial sector trust our automated fax service to enable them to securely send and receive the myriad documents they rely on to successfully conduct their business — including loan applications, trading confirmations and related contracts. Insurance companies: From benefits claims to case reports, insurance companies need to exchange large amounts of information — often still filed in paper form — to operate effectively. That’s why cloud-based fax services bring insurance companies to a new level of organization and efficiency. Government organizations: Approved for use by federal, state and municipal agencies, our automated fax solution is cleared for government use via GSA Schedule — GS-35F-0480R. Whether you’re processing contracts or civil service documents, Softlinx can help. Schools and educational institutions: For educational institutions that have to transfer large amounts of student and human resource data — but don’t want to overburden their IT departments with troublesome on-premise fax equipment — automated fax services offer an efficient solution. Plus, schools using our service avoid the long-distance phone fees associated with traditional faxing methods. To find out how easy it is to make the switch to reliable, cost-effective cloud-based fax services, contact us to schedule a live demo. For informed answers to any questions you might have, call us at 800-899-7724 today. Fax-enable virtually any business application using ReplixFax Web Service APIs and Toolkits to automate electronic document delivery by fax. Flexible routing rules and metadata handling allow fax documents to be filed in network folders or delivered to back-office applications. Just drop a document to fax with proper fax metadata into a selected folder to submit a batch fax request to automate outbound faxing. Automated fax back confirmation to the sender prevents potential disputes for important financial, healthcare or legal transactions. Process barcode-based case documents to automate electronic document workflow along with a triage web application to handle exceptions. Add-on conversion module turns received faxes into a searchable PDF document or extracts data to support electronic document workflow.